The handy extra table mate tray always at your service! The handy extra table mate tray always at your service! Assembles in minutes, with no tools needed! It adjusts to fit your needs; different heights from 28" to 22" tall, 4 table angles, extra large table top is 15.5 inches x 20 inches. 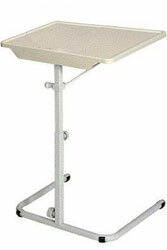 Slides right up to your body for ease of use; lipped table top edge keeps items from falling off! Comes apart for easy storage under most sofas and chairs! Lightweight easy to move, the durable steel construction won’t bend or buckle. The smooth design wont mark floors!